Winter 2011/2012. This issue's main features bring you Boss coverage from A to Z: that's Appel to Zimny, extensive Backstreets interviews with each. 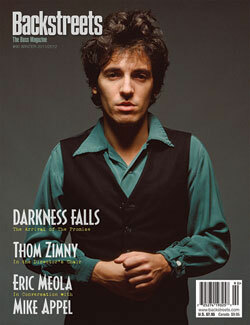 For our first talk with Mike Appel in 20 years, we asked Born to Run photographer Eric Meola (who also provided the front and back cover shots for this issue) to sit down with Bruce's former manager for a chat. The result is a wide-ranging discussion of Appel's time with Bruce from the early '70s to their 2009 reunion in Buffalo. Along the way Appel describes shows like Sing Sing Prison and the Anne Murray blowout at Central Park. With rare in-studio shots from Peter Cunningham. For our massive interview with Thom Zimny (Springsteen's film archivist, director, and editor of choice for the last decade), Backstreetseditor Christopher Phillips spent multiple sessions at Zimny's NYC studio for an in-depth look at his post-Wings for Wheels work with Bruce. Part I takes Zimny through "Night with the Jersey Devil," "The Wrestler," "Super Bowl Journal," the "Working on a Dream" DVD, and London Calling: Live at Hyde Park; in Part II, it's The Promise, discussing Zimny's Darkness documentary as well as the Houston and Paramount Theatre performance films (and how the latter was influenced by Jean-Claude Van Damme). Plus: Clarence Clemons, 1942-2011 (our full Big Man tribute to come in issue #91); the E Street Band at the Asbury Park Carousel House and other performance reports; Springsteen and Ed Norton in Toronto; Lisa Lowell's Beautiful Behavior; Dropkick Murphys; Springsteen in the comics; the Jukebox Graduates middle-school Springsteen club; rare releases from The Promise; the latest eBay collectibles report; reviews of the latest CD-Rs and Bruce boots, and more.